In 2018, Canada has an estimated population of 36.95 million, which ranks 38th in the world. Canada is the world’s second largest country by total area (behind Russia) and the largest North American country. Canada extends from the Pacific to the Atlantic and north to the Arctic Ocean. The United States-Canadian border is the longest land border in the world. Canada’s most recent census was conducted in 2016. At the time the population was counted at 35,121,728, which represents a 4.9% increase from 2011. The average age of Canadians also increased to 41 years, up from 40.1 in 2011. The next census in Canada is scheduled for 2021. Prior to 2016, the last census was completed in Canada on May 10 2011. Figures released on February 8, 2012 showed that the officially recorded population of Canada was 33,476,688. Canada is one of the most sparsely populated countries in the world, with much of its land inhospitable. The country’s population density is under 4 people per square kilometer, which ranks 228th in the world. Canada’s population has tripled since the 1940s, growing from 11 million at the time of the second world war to over 36 million today. Population growth has been fairly consistent over the past fifty years and shows no sign of slowing. Between the last census in 2006 and 2011, the number of people in Canada increased by an impressive 5.9%. Canada’s growth is fueled largely by immigration. In fact, relative to its size, Canada is the largest importer of human capital in the Group of Eight, attracting even more immigrants per capita than the USA. Natural population growth, by contrast, accounts for only around one-tenth of Canada’s overall population increase each year. Worldwide, Canada is 9th in crude net migration rate, and nearly 22% of Canadians identify themselves as immigrants. 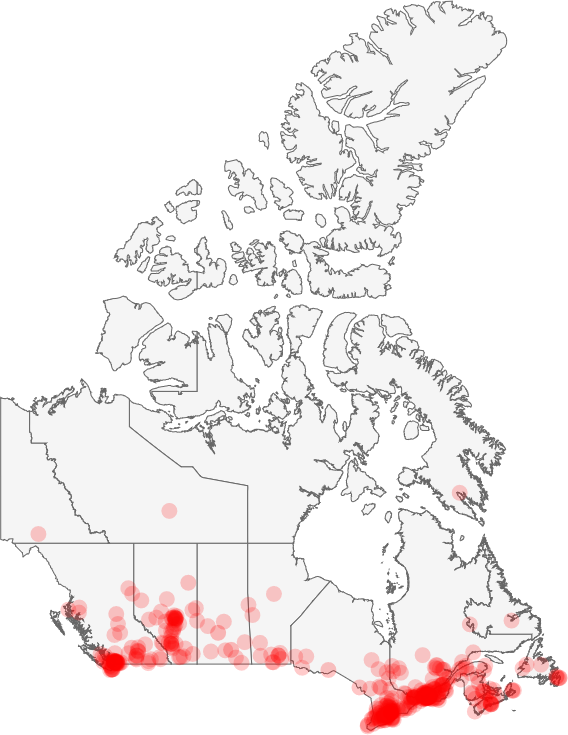 Given the large geographical area of Canada and its relative affluence, it is likely that its population will continue to grow rapidly for decades to come, leading some to speculate as to what a Canada of 100 million people might look like, and whether increased population combined with unrivaled access to natural resources would make Canada a global superpower. The census results also show the population of each Canadian province and territory. More than half of Canadians live in just two provinces: Ontario, where one in three Canadians live, and Quebec where almost a quarter of Canadians live. The combined population of Canada’s three territories (Northwest, Yukon and Nunavut) is less than the population of Canada’s smallest province (Prince Edward Island). The largest city in Canada by population is Toronto, home to 2,615,060 people at the time of the 2011 census, and 2,731,571 in 2016. The wider Toronto metropolitan area is over twice as populous, containing around 6 million people in total. Canada’s second largest city is Montreal in Quebec, where 1,704,694 people live (up from 1,649,519 in 2011), followed in third place by Calgary in Alberta with 1,239,220 (up from 1,096,833). Calgary is growing at almost twice the Canadian average, so if current trends continue it will no doubt overtake Montreal in the future. Ottawa is Canada’s fourth largest city – 934,243. The fastest growing large city between 2006 and 2011 was Brampton, Ontario. In the 5 year period, the city grew by nearly 21% en route to surpassing 500,000 residents. Montreal is the slowest growing major city in Canada, with growth of just 1.8% from 2006 to 2011. By comparison, Canada itself grew by 5.9% during the 5 year period. In 2016, the fastest growing large city was Edmonton, which grew by 14.8% between the 2011 and 2016 censuses. Brampton continued its climb upward, adding 13.3%, and Calgary also grew by over 13%. As you can see from the map in the section below, the majority of Canadians live in a narrow Southern belt along the border with the United States. There are two main reasons for this. The first is that the most hospitable part of Canadian territory is in the south. Summers are warm and winters are not too harsh, making the area suitable for agriculture. The second reason is the majority of Canada’s trade (both import and export) is with its US neighbor, and it makes sense for the majority of Canadians to live as close to the US border as possible. Canada as a whole has a population density of just 4 people per square kilometers, which makes it the 228th most densely populated country. The population density is among the lowest in the world, mostly because a great deal of the country to the north is virtually uninhabited. Toronto, meanwhile, is one of the largest metropolitan areas in the world with a density of 2,930 people per square kilometer. 32.3% of Canadians considered their ethnic origin to be Canadian. Other major groups recorded were English (18.3%), Scottish (13.9%), French (13.6%), Irish (13.4%), German (9.6%) and Chinese (5.1%). When reading these figures, you should bear in mind that census respondents could select multiple ethnic groups. Canada’s aboriginal people are growing at twice the national rate. While 4% of the population claims an aboriginal identity, another 16% belongs to a non-aboriginal visible minority. Nearly 22% of the population is now foreign-born, and about 60% of new immigrants come from Asia, particularly China and India. English and French are the official languages of Canada. In 2016, 56% of Canadians reported that English was their first language and 20.6% reported that French was their first language. The only other language in Canada that is the mother tongue of more than a million people is Chinese. Although there are 11 aboriginal languages, only a few are spoken by enough people to ensure that they are safe from extinction. Data on religious belief is only collected in every other census. The [last data,] collected in 2011, indicated that 67% of Candians were Christian, 24% had no religion, and 3.2% were Muslim. Other major religious groups were Jewish (1%), Buddhist (1.1%) and Hindu (1.5%) and Sikh (1.4%). An impressive 2.8 million Canadian citizens live outside of Canada itself; that’s equivalent to 9% of the overall Canadian population. For comparison, only 1.7% of US citizens live abroad but more than 20% of New Zealanders live abroad. Around 1 million Canadians live in the United States. The next most popular destination is Hong Kong, where approximately 300,000 Canadians are based. Around 4 in 10 Canadians living abroad were born in Canada, but a larger proportion (6 in 10) are naturalized Canadian citizens who have moved back abroad — most, but not all, to their country of origin. As Trovato put it, Canada still needs a robust increase to keep up with demands in the workforce and maintain a strong economy. It may be time for policymakers in the country to consider ways to boost Canada’s fertility rates, such as with “family friendly” policies that allow women to combine a family with a career.